Effective October 1, 2018, securities industry professionals holding a securities representative-level license are qualified to sell specific securities products, depending on which license is held, a Series 6 or a Series 7. As part of the process of becoming securities licensed, all candidates must pass both the Securities Industry Essentials (SIE) exam and a representative-level top off exam. 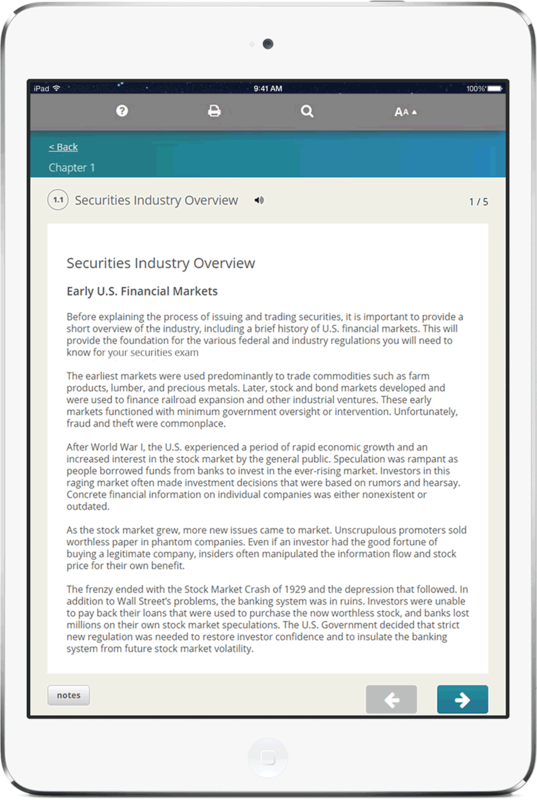 The SIE exam measures entry-level knowledge of basic securities industry concepts. SIE exam candidates must have a basic understanding of markets, securities products and their risks, securities trading, customer accounts, prohibited activities and the regulatory framework. This course will deliver the content needed to successfully complete the examination requirements. Federal securities regulations, registration, qualification and termination of employment processes, product definitions and classifications, communications with the public, investment company definitions, classifications and registration, prospectus requirements, evaluating customer's financial information, investment objectives, suitable recommendations, types of investment returns, tax considerations, securities markets, prohibited activities, customer accounts, activity, confirmations and complaint procedures, investigations, code of arbitration and code of procedures, sanctions and penalties. "The information that was given was very helpful to me in passing the exam"
"My experience with A.D. Banker was great, the information that was given was very helpful to me in passing the exam. What I loved the most about A.D. Banker was the overall comprehensive exam at the end that was 110 questions. After I had passed the test the first time, I would go over all my notes and take the test again until I felt like I knew the material. I was surprised to see some of the same questions that was asked of us on the practice test was on the real test. This is a great system and I'm thankful that it was in place for me to be able to pass the actual test. Thank You."